Keeping with the 'let's give it everything' theme, Panasonic has put virtually every feature imaginable on the GX7. Some of these features are old friends, such as Intelligent Auto mode, Intelligent Dynamic, and Intelligent Resolution. There are several new features of interest, such as tone curve adjustment, a 'silent mode', and a 'clear retouch' option which lets you delete unwanted subjects from a photo. Below we'll look at the most interesting features on the DMC-GX7. 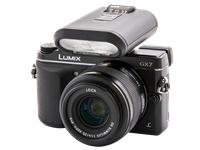 The Lumix GX7 is Panasonic's first mirrorless camera to feature sensor-shift image stabilization. Previously, Panasonic built optical stabilization into most of their lenses (save for its prime and 7-14mm models), so this wasn't necessary. But by building image stabilization into the body, the GX7 also brings shake reduction to Olympus' Micro Four Thirds lenses (which don't have it, since Olympus' cameras have in-body IS as well). We tried a pair of Olympus Micro Four Thirds lenses that don't have image stabilization (the 12mm and 17mm primes) and the in-body IS system worked as advertised (again, it only operates as the photo is taken). Many other lens mounts can be used with the GX7 and yes, that means that they'll have image stabilization for still shooting as well. Attaching an old Konica lens via an adapter worked fine, with the only change being that you must tell the camera what the focal length is. 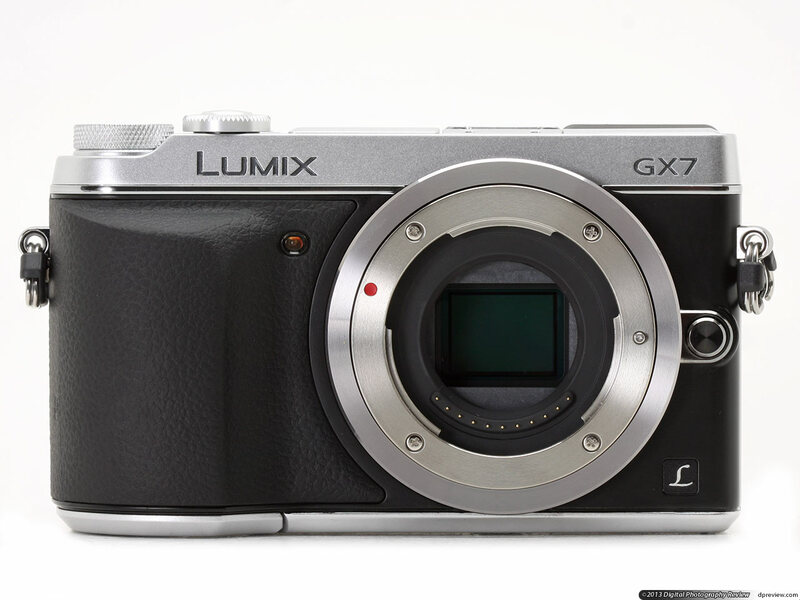 The GX7 is the first Panasonic G-series camera to feature sensor-shift image stabilization. The 16 megapixel Live MOS sensor is also a new design. The downside? There's no shake reduction while you're composing a photo, so things can get wobbly when you're using a telephoto lens. In addition, the in-body IS system does not work in movie mode. Another new feature on the GX7 is tone curve adjustment, which you'll also find on several Olympus mirrorless cameras, including the E-P5 and E-M1. There are four presets (standard, higher contrast, lower contrast, brighten shadows) plus three custom slots, all of which can be customized. The tone curve adjustment lets you use the front and top dials to tweak contrast to your liking. Any changes will be saved to one of the three custom slots. The shadows and highlights can be adjusted from -5 to +5 in one-stop increments in either direction. The results are previewed in real-time on the LCD and EVF. A feature that makes the DMC-GX7 a great 'stealth camera' is its silent mode. When activated, the camera switches from the mechanical shutter to the electronic one, disables all the blips and bleeps, and shuts off the AF-assist lamp. The results are impressive. The camera is truly silent, to the point where a person standing right next to you cannot tell when a photo was taken. An additional benefit is that can you shoot considerably faster in burst mode: 10 fps at full resolution and 40 fps at 4 megapixel. Banding can be an issue when using the GX7's electronic shutter in artificial lighting conditions. This particular photo was taken under fluorescent light. So what's the catch? 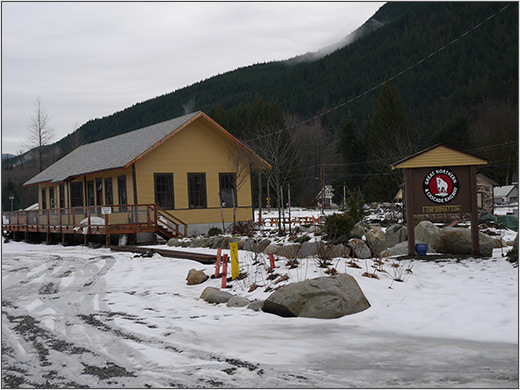 The flash is unavailable, and the ISO range narrows to 200 - 3200. In addition, the slowest shutter speed you can use is 1 second. And, because the camera is using its electronic shutter, there's a risk of the rolling shutter effect (as the sensor effectively scans the scene, top to bottom), distorting moving subjects. There's also a risk of artificial light leaving banding across images as the scanning of the sensor captures the flickering of the lights. 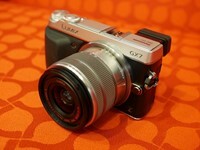 While the old DMC-GX1 (and video-focused GH3) lacked focus peaking, it's out in full force on the GX7. Focus peaking is for use in manual focus mode. When your subject is in-focus, it will be outlined by a color that 'glimmers'. You can use this tool to make very precise adjustments to the focus distance. While difficult to see here, there are yellow lines showing what areas of the subject are in-focus. There are two levels of sensitivity to choose from, aptly named low and high. You can also select the color of the outline: blue, yellow, or green. In low light, focus peaking can be difficult to see, as noise is often highlighted, rather than high-contrast regions. In good light, it works very well. Another feature that the GX1 was missing is HDR, or high dynamic range. 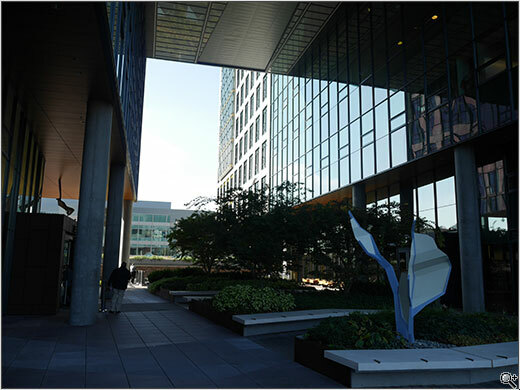 HDR combines a series of photos (usually three), each shot at a different exposure, into a single image with a wider range of tonal information. The idea is that it allows the capture and inclusion of more highlight information and shadow detail than a single exposure. The first thing to know about HDR on the GX7 is that it's for JPEGs only. You must turn off Raw or Raw+JPEG to even access the HDR menu item. Once you're there, you can fire away. There are four 'levels' of HDR to choose from: Auto, 1EV, 2EV, or 3EV. The larger the interval, the more pronounced the effect. 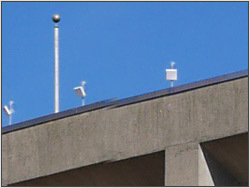 You can also choose whether or not the camera tries to align the three images. The comparison above was taken with HDR set to 'Auto'. As you can see, the shadows get brightened quite a bit, while the correct highlight tone returns to areas that were clipped in the original. You will notice that the HDR version is a bit 'cropped' compared to the original (to give the camera flexibility to match slightly misaligned images) but that's a small price to pay for the improvement in contrast. The last time we looked at the HDR feature on a Panasonic mirrorless camera was when we reviewed the DMC-GH3, and we found it did poorly if the was any movement within the scene. The GX7 does a lot better, with only a minor error occurring around the head of the security guard, towards the lower left of the shot. The HDR photo does seem to be softer than the original, as well. The GX7 shoots fast enough that you won't need a tripod - at least in good light. 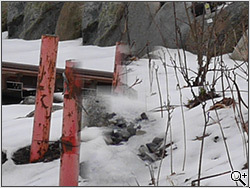 Another feature you can use to improve image contrast is i.Dynamic, which we'll cover on the Dynamic Range page. 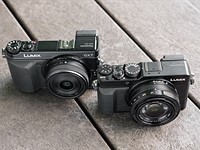 The Lumix DMC-GX7 has a 'Panorama Shot' feature, which has slowly been appearing on mirrorless cameras over the last year. 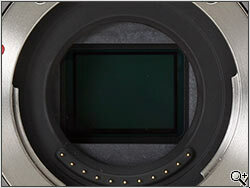 The exception is on the Sony NEX cameras, which have had this 'sweep panorama' feature since the beginning, which isn't surprising, considering Sony was looking for ways to promote the speed advantages of the CMOS sensors it makes. Taking panoramas is simple. Select the Panorama option from the Scene mode (which has a whopping twenty-four options, by the way) and pan the camera from left to right (or the direction of your choosing). As you can see above, the results can be impressive. There are just a few stitching problems, as well as some muddy details on the 'tower' at the center of the photo. 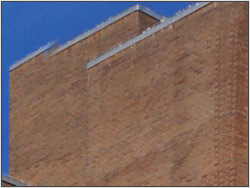 Another stitching problem, plus some muddy detail on the bricks, which may have nothing to do with this being a panorama. If you're shooting a panorama with a large amount of contrast, the camera will not dynamically adjust the metering across the scene. If you want to add some 'style' to your panoramic images, the GX7 offers 18 'Creative Controls' (also available for stills) which lets you quickly adjust the color or apply special effects. 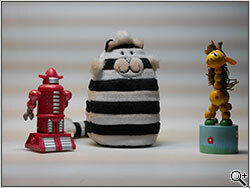 If you're a fan of Wallace & Gromit or The Nightmare Before Christmas, then you'll know what stop motion animation is. 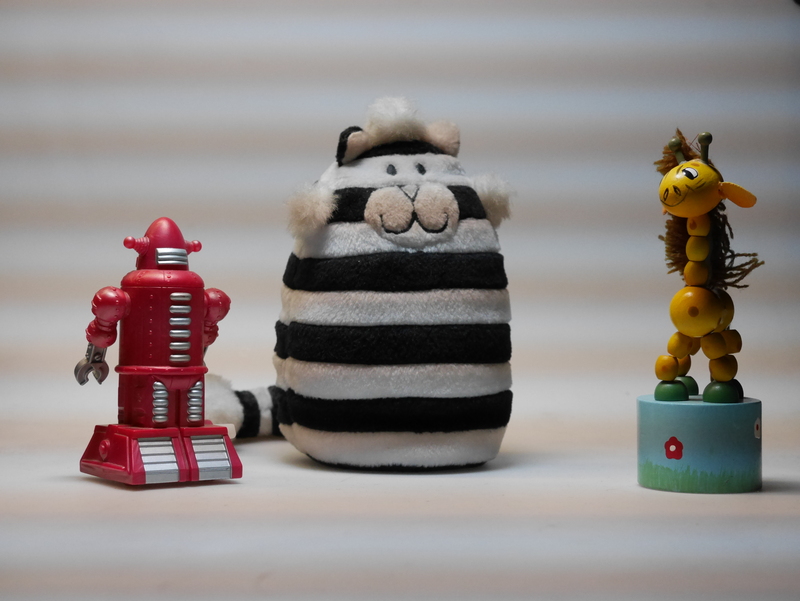 By taking a photo, slightly moving your subject, and taking another picture (repeatedly), you can obtain a choppy but effective animated movie. On the GX7 you can take as many pictures as you'd like, and the camera will put them together into a video for you. The original stills are saved, as well. The camera can 'auto shoot' at set intervals (you'd better be quick) or you can take them at your own pace. The GX7 displays an overlay of the previous shot, so you can see exactly what's moved. Another, more common feature on the GX7 is time-lapse. 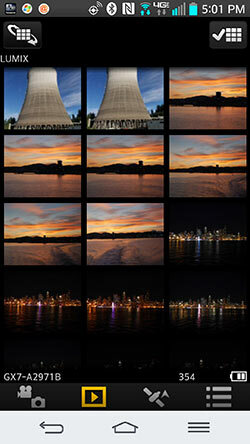 Simply choose the start time, interval, and number of photos to be taken, and the camera does the rest. Just remember your tripod (and AC adapter if you're being ambitious). Samsung has been toting the 'Photo Eraser' feature on their smartphones, and you can do the same thing on your GX7 using its 'Clear Retouch' option. The idea is that it lets you 'remove' unwanted subjects from a photo. The camera doesn't give very clear instructions on how to use this feature - the word 'trace' implies outlining, at least to us - but carefully running your finger over the item you want to remove will turn it red. Once that's done, the camera will grind away for a few seconds and then display the result. 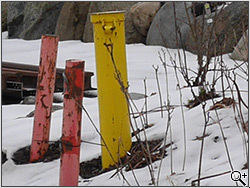 Let's say that you want to remove that unsightly yellow pole from the photo. After toying around this feature, we think you're better off using the clone tool in Photoshop or pretty much any basic image editing software, instead. The Lumix DMC-GX7 offers a fairly elaborate Wi-Fi feature, which includes remote camera control from your smartphone. In order to take advantage of smartphone connectivity, you'll first need to download the Panasonic Image App for iOS or Android. The most difficult part of the process is pairing your mobile device with the GX7, which can be accomplished in several ways. If your smartphone supports NFC (near-field communication), you can 'tap' the two devices together at a designated spot. Previous experience with Panasonic's NFC implementation has been frustrating, and while it's better on the GX7, we still saw quite a few connection failures. If you don't want to deal with NFC - or don't have a device that supports it - you can type the network details into your smart device. Once connected, you can remotely control the GX7, with a good selection of shooting options. 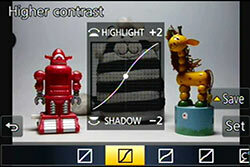 You can touch the screen to focus or meter, or turn on touch shutter which will take a photo instantly. 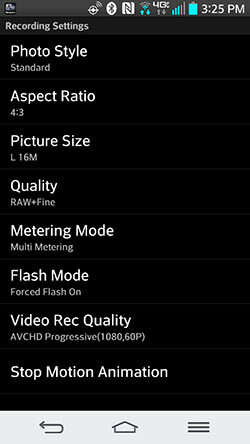 Settings such as white balance, ISO, focus mode, and even the aperture and/or shutter speed can be adjusted (which is an unusually high level of control, for such cameras). If you're using a power zoom lens, that too can be controlled from the app. One thing you cannot do is switch shooting modes, which requires a trip to the 'real' mode dial. 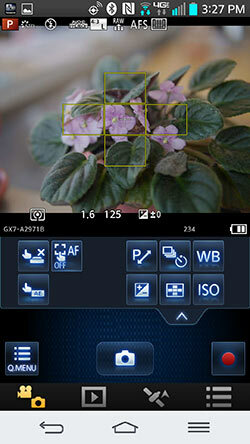 Above you can see the various settings you can adjust when controlling the camera with your smartphone. 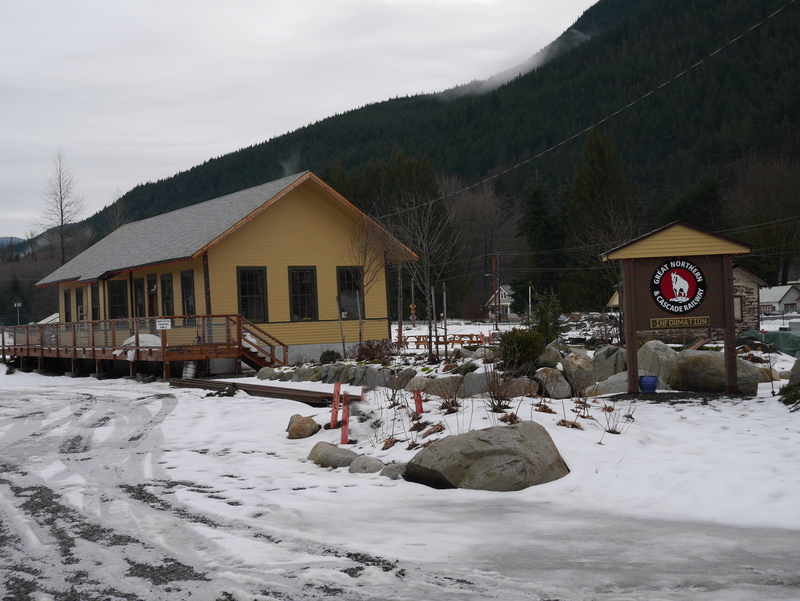 The quick menu offers less commonly used settings. You can also transmit photos directly from the camera to another device as they are taken. In addition to a smartphone, photos can be sent to a PC, 'web service' (such as Facebook, YouTube, Flickr), Panasonic's cloud service, or compatible televisions. In order to share photos to social networking sites or cloud storage, you must sign up for Panasonic's LUMIX Club (since all images are uploaded there first), which is an exercise in frustration. Browsing photos on the GX7's memory card using the Panasonic Image App. If you don't want instant photo transfer, there are a couple of ways to get them from the camera to your smartphone after the fact. 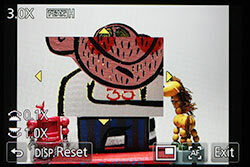 One way is to connect the two devices as if you're shooting, and then browse what's on the camera's memory card (shown above). Alternatively, you can browse through individual photos on the camera and the connect to your device to transfer the images. If you're using NFC, you can also 'tap' to transfer images. Overall, the GX7's Wi-Fi feature sounds good on the surface, but the user experience and reliability could be a lot better.